Newspaper Coverage of 1948 IJA Convention, Jamestown, N.Y. 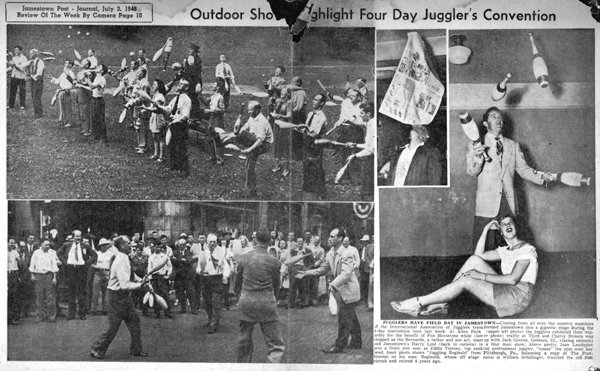 This photographic coverage of the 1948 IJA Convention appeared in the Jamestown Post-Journal, July 3, 1948, in a layout entitled "Review of the Week by Camera: Outdoor Shows Highlight Four Day Jugglers Convention." The caption: "Jugglers Have a Field Day in Jamestown --- Coming from all over the country, members of the International Association of Jugglers transformed Jamestown into a gigantic stage during the four-day convention here last week. At Allen Park (upper left photo) the jugglers exhibited their wizardry for the benfit of Fox Movietone while (lower photo) traffic at Third and Cherry Streets was stopped as the Bernards, a father and son act, team up with Jack Greene, Geneseo, Ill., (facing camera) and Jamestown's Harry Lind (back to camera) in a four man show. Above, pretty Joan Landquist gets a front row seat as Eddie Tierney, top ranking professional juggler, 'tosses' the pins over her head. Inset photo shows 'Juggling Reginald' from Pittsburgh, Pa., balancing a copy of the Post-Journal on his nose. Reginald, whose off stage name is William Schillinger, traveled the old Sun circuit and retired four years ago." Material: Newspaper article on newsprint; irreversibly laminated in plastic. Photographer: No photo credits given.